Raspberry Rainbow: All stitched up with love. 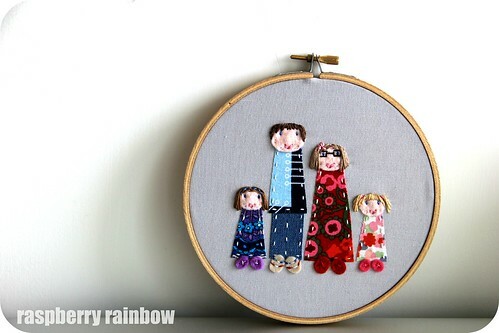 I recently commissioned Sonia from Dandelyne to make our family portrait. This is how we look, all stitched up. It warms my heart looking at it, our little family frozen in time, made out of fabric and thread and stitched up with love by Sonia. I supplied the fabric for our outfits, some of it sentimental. The purple paisley fabric used in Abbey's dress is vintage. I bought a remnant of this fabric at an opshop (charity shop) almost 20 years ago. As a teenager, I made a mini skirt out of it. Unfortunately, the skirt no longer fits, but I have kept it to re-purpose one day. I love this fabric. The fabric used in my dress is Liberty, I adore Liberty. Enough said. How cute are Zoe's pony tails? Love them! And the head band in Abbey's hair, perfect. Sonia really captured us perfectly. I have never met her, we do not know her. She managed to make us perfect by looking at photos of us, how clever is that? You can find the Dandelyn shop here and her facebook page here. Do pop in and be amazed at what she can stitch up. Thank you so much Sonia, you are one clever lady! I love her work!! - a stitched up version of us is my next buy for sure!! That really is just the cutest thing! She's a very clever girl. And your family is so adorable! 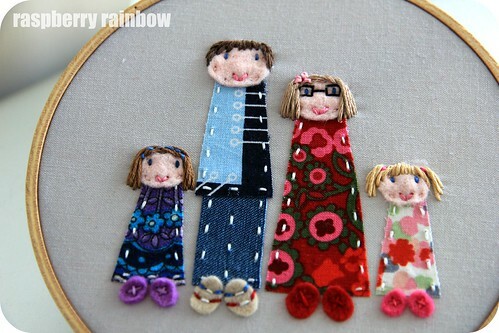 I love the individuality of your family portrait..very clever and unique!